Plunge into the bustling, biodiverse communities hidden within coral reef ecosystems around the world to discover how corals live, breathe, and reproduce. Narrated by Tony Award ® winner Lea Salonga, Expedition Reef digitally recreates coral reef environments for a truly immersive, full-dome experience. 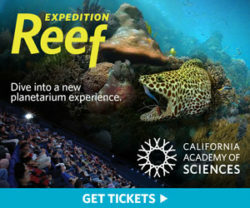 From the comfort of a planetarium seat, viewers can travel the globe to explore coral reefs teeming with life and learn how scientists are racing to develop sustainable solutions to protect these vitally important ecosystems for the future.